We're just three days away from the unofficial start of the hockey season. 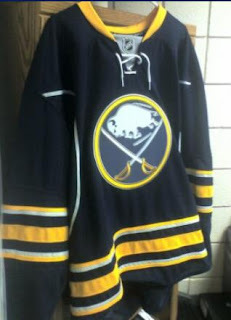 Saturday the Sabres will unveil their new "third" jersey, purported to be a remake of the classic jersey (I'm told that the photo at right is REALLY it - although no one from the Sabres organization will confirm it). And the other day they announced that they'd be releasing a new DVD, "The Making of a Classic," a documentary DVD about the Winter Classic game and what it took to put it together. Like the other DVDs the Sabres have released in past years - "Top Shelf," and "Better Days," the DVD is only $10 and will be available at the Sabres store. Saturday's event at HSBC Arena, called "Puckdrop 2008," will also feature an adult street hockey tournament and live music. Plus individual tickets go on sale. Friday Sabres PR Director Mike Gilbert will be on Reason at 10 a.m. to give some more details on "Puckdrop 2008," and talk about the new team.